We offer unique innovative products for home and garden that are sourced locally as much as possible, organic, all natural, biodegradable, recycled, recyclable, repurposed and renewable. We select products whose materials used in manufacture are sustainably procured, organically grown, natural, recycled, reusable, reclaimed, recyclable and whose workers are receiving a fair wage and safe work environment. Taking your tea with you has never been easier with the help of a good Tea Traveler. It’s simple directions, quality construction, and overall ease of use make it one of our favorites! If you have an avid tea fan in your life, know someone trying to kick a coffee habit, or just to spoil yourself, the Tea Traveler takes all the hassle out of brewing a tea bag on the go. And you’ll never have to wait in line in the drive-thru at the coffee shop for a cup of green tea- you’re all set! Check out the video above to see just how simple the Tea Traveler is. Plus hear so inside tips and tricks to make tea-on-the-go even easier. Want you’re own? Click the link below to get it now! 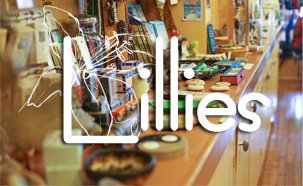 Also located in historic downtown Cedarburg, Lillies offers a huge selection of Fair Trade, Eco-Friendly, Natural & Organic gifts & clothing.